An invisible force pushed me back to the solid forest ground. The portal sealed off with one last burst of light, and then I was left alone with the eerily tall trees. I lay on the forest floor for a moment, shuddering from the encounter with the woman. I pushed myself off the ground and crossed the dirty forest path to the twins’ house, still jittering. It didn’t take long for me to register the familiarity of the woman: her black hair, charcoal eyes, venomous tone. Now Arica and her cousins are summoned to go on a dangerous search that leads them to the waters of the Bermuda Triangle. 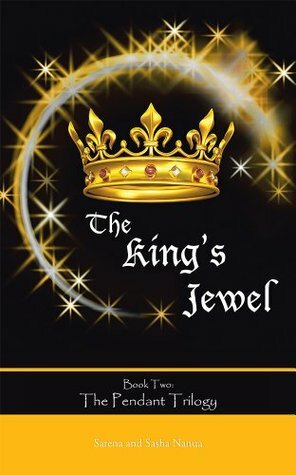 If Arica wishes to return home, she must find the gemstones and unlock the mystery of the Jewel’s thief; but what she doesn’t realize is that the culprit could be closer to her than she’d ever imagined…. This was a fantastic second book in The Pendant Trilogy. I had really high expectations after reading The Gemstone and it did not let let me down! I loved every second of reading this book and I can't wait to start the last book - also sad that it will be over. I liked Arica even more in this book than in the first, she got more powers and it was awesome. Though a little naive at times and too trusting, she is still a great protagonist. Of course I adored the twins, they always found away to make me laugh, along with their brother. I kind of imagine myself as a Joseph sometimes because he always wants to be reading - that's so me. Sasha and Sarena did it again and better. I love their writing style and this amazing world that they created. The way they describe things makes me feel like I'm standing right there, I loved it. They really know how to write about magic which really impresses me. I especially loved the involvement of chimeras -I've been fascinated by chimeras since I watched Fullmetal Alchemist. This is a great series and I think everyone should read it. I just ordered the last book and can't wait to sink my teeth into it.